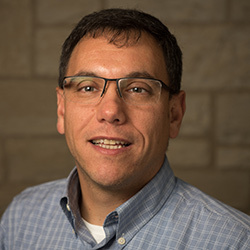 Prof. Durango-Cohen's research activities involve developing and analyzing optimization and econometric models to support monitoring, management and operation of transportation infrastructure systems. He has also published in transportation economics and policy, as well as in environmental design and life-cycle assessment of transportation systems. Among others, his research has been recognized with a Faculty Early CAREER Development Award from the National Science Foundation in 2006, and with a Young Author Prize at the 2007 World Congress on Transport Research. Chen, Y.and Durango-Cohen, P.L. (2015), ``Development and field application of a multivariate staistical process control framework for health-monitoring of transportation infrastructure", Transportation Research Part B: Methodological, 81, pp. 78--102. Chen, Y., Corr, D.J., and Durango-Cohen, P.L. (2014), ``Analyis of common-cause and special-cause variation in the deterioration of tansportation infrastructure: A field application of statistical process control for structural health monitoring'', Transportation Research Part B: Methodological, 59(1), pp. 96--116. Durango-Cohen, E.J., Torres, R.L. and Durango-Cohen P. (2013), ``Donor segmentation: When summary statistcis don't tell the whole story'', Journal Interactive Marketing﻿, 27(3), pp. 172--184. Zhang, Z. and Durango-Cohen, P. (2012), ``A strategic model of public-priate partnerships in transportation: Effect of taxes and cost structure on investment viability'', Research in Transportation Economics, 36(1), pp. 9--18. Lindsey, M., Schofer, J., Durango-Cohen, P. and Gray, K. (2011), ``The effect of residential location on vehicle miles of travel, energy consumption and greenhouse gas emissions: Chicago case study'', Transportation Research Part D: Transport and Environment, 16(1), pp. 1--9. McKenzie, E. and Durango-Cohen, P. (2010), ``An input-output approach for the efficient design of sustainable goods and services'', The International Journal of Life Cycle Assessment, 15(9), pp. 946--961. Durango-Cohen, P. and Sarutipand, P. (2009), ``Maintenance optimization for transportation systems with demand responsiveness'', Transportation Research Part C: Emerging Technologies, 17(4), pp. 337--348. Chu, C.-Y. and Durango-Cohen, P. (2008), ``Incorporating maintenance effectiveness in the estimation of dynamic infrastructure performance models'', Computer-Aided Civil and Infrastructure Engineering, 23(3), pp. 174--188. Chu, C.-Y. and Durango-Cohen, P. (2008), ``Estimation of dynamic performance models for transportation infrastructure using panel data'', Transportation Research Part B: Methodological, 42(1), pp. 57--81. Durango-Cohen, P. and Sarutipand, P. (2007), ``Capturing interdependencies and heterogeneity in the management of multifacility transportation infrastructure systems'', Journal of Infrastructure Systems, 13(2), pp. 115--123. Durango-Cohen, P. (2007), ``A time series analysis framework for transportation infrastructure management'', Transportation Research Part B: Methodological, 41(5), pp. 493--505. Durango-Cohen, P. and Tadepalli, N. (2006), ``Using advanced inspection technologies to support investments in maintenance and repair of transportation infrastructure facilities'', Journal of Transportation Engineering, 132(1), pp. 60--68. Childress, S. and Durango-Cohen, P. (2005), ``On parallel machine replacement problems with general replacement cost functions and stochastic deterioration'', Naval Research Logistics, 52(5), pp. 409--419. Durango, P. and Madanat, S. (2002), ``Optimal maintenance and repair policies in infrastructure management under uncertain facility deterioration rates: An adaptive control approach'', Transportation Research Part A: Policy and Practice, 36(9), pp. 763--778.